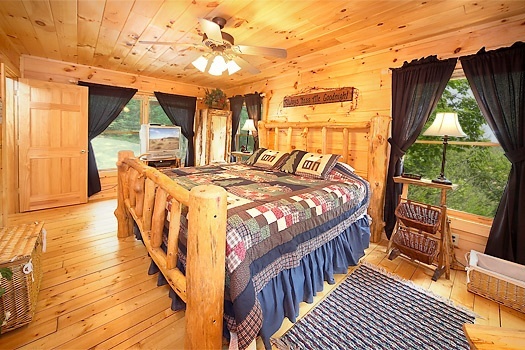 2 Lovin' Bears is a custom built one bedroom one bath log cabin in the Great Smoky Mountains. Come enjoy a vacation that you won't soon forget. 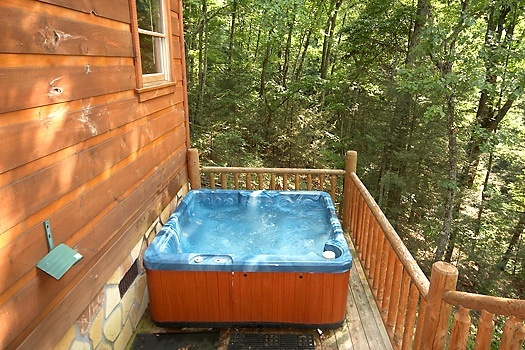 With all the amenities you could ask for in a Premium cabin, fully equipped kitchen, 42" Plasma Flat Screen TV,DVD player, VCR and Satellite, Jacuzzi tub in the master suite, Custom King size log bed, hot tub outside on the deck, a large upper observation deck with amazing mountain views and much more. 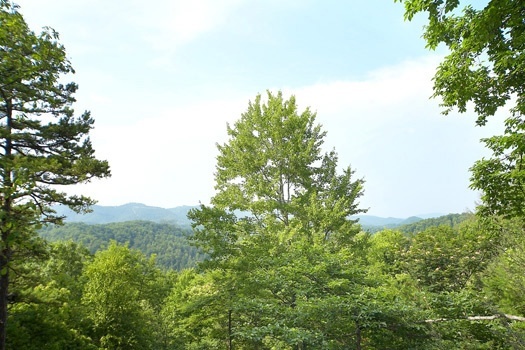 Don't miss your chance to stay in this Amazing Mountain Hideaway. We had a fantastic time and the cabin was just amazing. I was nervous upon checking in without having to go into a office but found that the process you provide for checking in is so much easier. We do plan to book again with American Patriot Getaways. My husband and I spent my birthday and 10 year anniversary in 2 Lovin Bears. We stayed with our 2 support dogs and this cabin was perfect for both our dogs and us. We will definitely stay with American Patriot Getaways again! Thank you so much for an amazing first time stay in a cabin. Had an awesome experience there.we loved the cabin and it was very relaxing.wr will definitely come back again. We only left once. It was so peaceful, we did not have the desire to leave. Also, it's extremely nice to be able to bring our dogs! I truly wish previous tenants would have had enough respect for the property not to throw their cigarette butts on the ground. Otherwise we thoroughly enjoyed ourselves celebrating 10 years of marriage! The person who helped me make the reservation was extremely helpful and patient! Thank you! All I can say is I wish we were still there, it was an absolute pleasure. We hope to be back next fall. God bless. 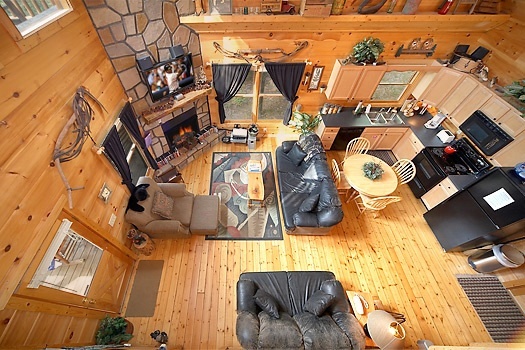 I always love the cabin we choose however, this may be my favorite yet! 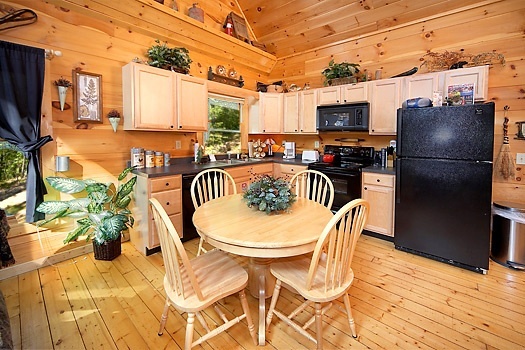 the area was amazing and the cabin itself was absolutely gorgeous! 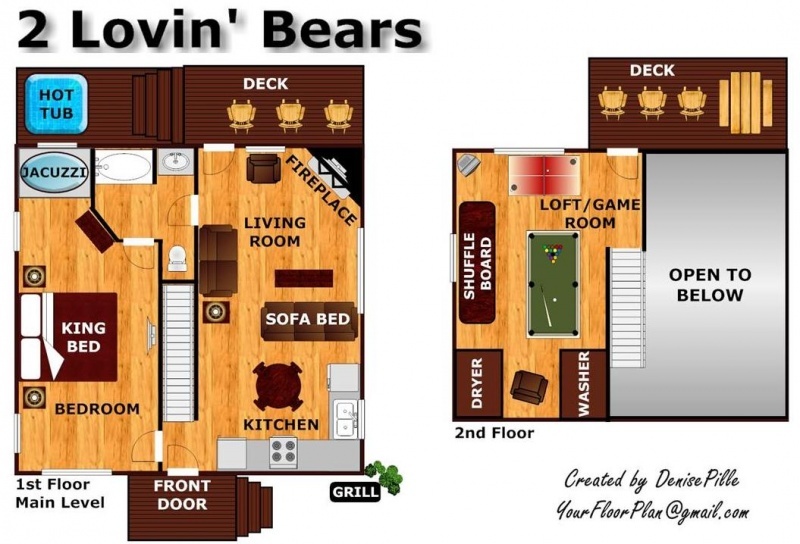 My husband and I had a wonderful honeymoon in 2 Lovin' Bears! The cabin was beautiful and had everything we needed in it. 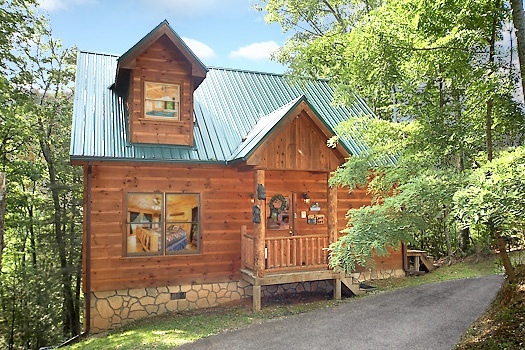 The location was great, very convenient to Gatlinburg and Pigeon Forge activities. Also, we loved that this cabin was pet friendly andwe could bring our two little dogs with us! The only negative thing I can say is that a couple of tree had grown up and the view wasn't quite as good as it could have been. Overall wonderful experience! Staying at this cabin was a wonderful experience. We were surprised and pleased with just how well-equipped the cabin with with extras such as kitchen utensils, blow dryer, etc. 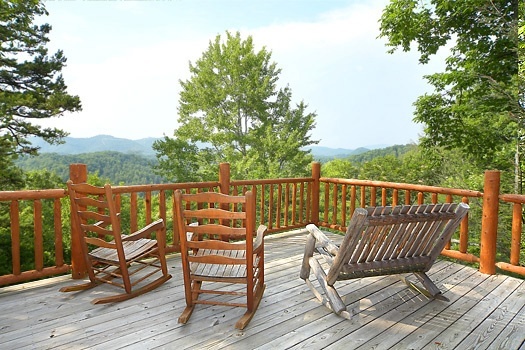 The cabin had an ample parking area, spacious interior, great entertainment room, but the best part was the amazing view from the beautiful observation deck. 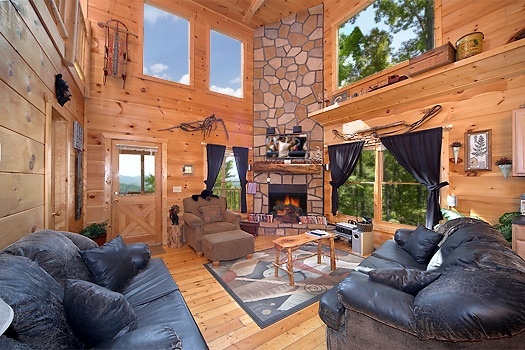 Loved the Cabin... It was an enjoyable stay!! The customer service lady was incredibly helpful and kind. I had many questions and she helped me so much!! The cabin was gorgeous!!! We will definitely stay with this company again!! Excellent stay - very satisfied. Good value & clean cabin. Perhaps my only minor complaint is that the lighting is a little dim in the bathroom and upstairs. Not a big problem at all and not enough to negatively impact our stay or our satisfaction. We alsoliked the easy automated check in. Thank you. 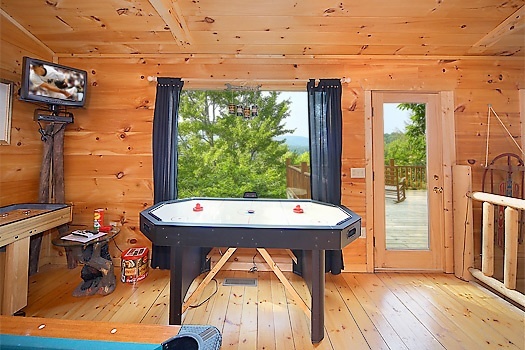 The perfect cabin for us. It had everything we could want! Haven't felt that peaceful and relaxed in a long time. Great weekend experience. 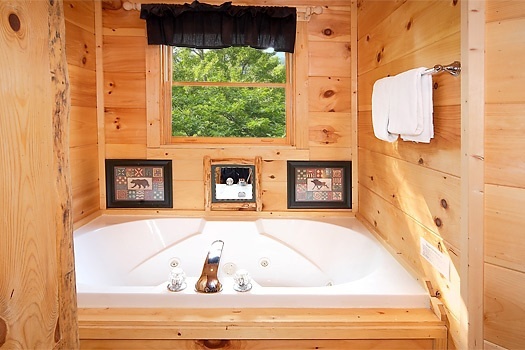 Cabin was exactly what we were looking for the two of us. Perfect location. We had a wonderful time at 2 Lovin bear Cabin. We had never been to Gatlinburg before. WE decided to come Gatlinburg for our honeymoon. 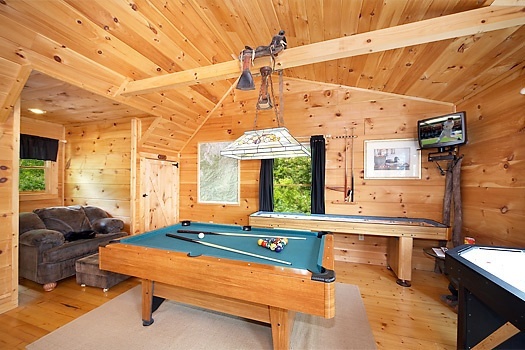 Everything was just great with the cabin. WE have already told other about it and will probably return again with more people.